I’m quite sure you know where I’m going with this category. Particularly if you have been reading my blog for the past few months, and know that I actually wrote about a certain space story several times. It was a first for humankind, it was a multi-national project, and it yielded some fascinating data. Of course, I’m talking about the first touchdown of a man-made object on a comet. More specifically, it was the little lander named Philae that had been travelling aboard the Rosetta space probe for the past decade. This probe had been chasing a comet on its way toward our Sun, using the Earth and Mars as gravitational slingshots in order to align with its orbit. 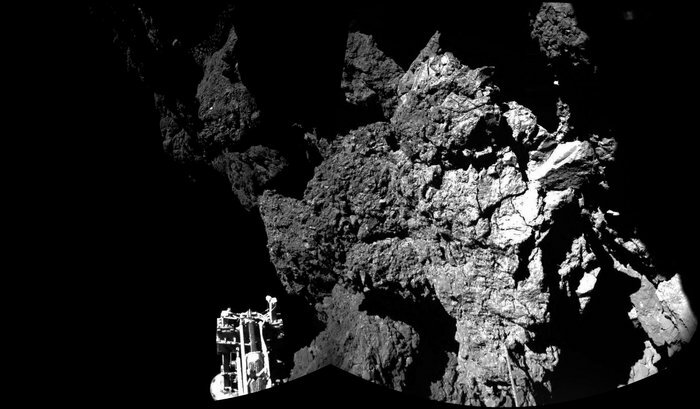 Finally, in November it caught up with the comet, and Philae was deployed. The landing was bumpy, and its batteries ran out after 57 hours, but during that time researchers gathered a rich collection of precious data and images from a space body that mankind has never touched before. Why bother going into space at all? Read this story from day 93! Pingback: Good morning, little Philae lander!